The music on this album contains original Jamaican funk and soul mainly released on 45s released in the years 1972-78. These cross-cultural musical gems exist on account of the hidden triangle of communication between 3 countries: America, Jamaica and Britain. The first link is the influence of American music on that of Jamaica from the late-1950s onwards; the second is the way in which, from the 1960s onwards, the new emerging market for Jamaican music in the UK influenced the styles of reggae coming out of Kingston. As a phase in the history of black American music, funk and soul spans from the mid-1960s to the mid-1970s (roughly between rhythm and blues and disco); but throughout the world, funk and soul was also absorbed into the musical melting pot of many different countries: from the afro-beat of Fela Kuti, the boogaloo of Tito Puente to the diverse sounds emanating from Kingston in the late-1960s and early-1970s. The connection between funk, soul and reggae is one of the strongest, all three containing a certain rawness and concentration on rhythm. Everyone knows the influence of rhythm and blues on ska and of soul music on rocksteady - both fostered by the powerful US radio stations in New York, Miami and New Orleans beaming the music across the Atlantic. 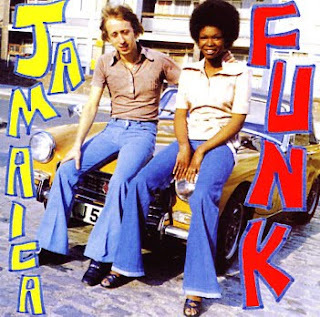 But funk’s influence is more pervasive; the syncopation of funk sits nicely over the off-beat of reggae, making the former an ingredient found in many of the latter’s stylistic turns from the late 1960s onwards; roots, steppers, rocksteady, dub can all be as funky as the more obvious versioning of James Brown, Gamble and Huff, Motown, The Meters, etc. On June 22, 1948 the SS Empire Windrush arrived at Tilbury docks bringing the first wave of post-war immigrant Caribbeans to Britain. Twenty tears on and thriving Jamaican communities in places such as Brixton, Bristol and Birmingham meant that Kingston record producers were now able to export their sounds to this new market; and a network of labels, distributors, promoters enabled Jamaican records to achieve success for the first time outside of their own country. With funk, soul and reggae sounds found at many a local disco in the UK, an obvious cross-pollinisation took place, with Jamaican producers and artists always quick off the mark with new trends. Here you will find heavyweight versions of funk and soul tunes by the likes of Betty Wright, The JBs, Bill Withers, Earth, Wind and Fire alongside original material from The Heptones, Cedric Brooks, Lee Perry and other greats of the Kingston musical scene in the early 1970s.